Hello Everyone! It's Lindsay from the DT here with you today, sharing two identical cards made with just one background. In my "craft room" (really just an over sized coat closet transformed into an office) storage space is not something I have a lot of, so I do have to be picky about what I choose to buy and store. One item I don't use a lot of and can easily make myself is patterned paper, which is what I did today. However, when looking at my card design I was disappointed in how much of the paper was going to end up hidden, so I decided to make that one piece of paper into two separate cards! Be sure to watch the video tutorial to see exactly how I did it! 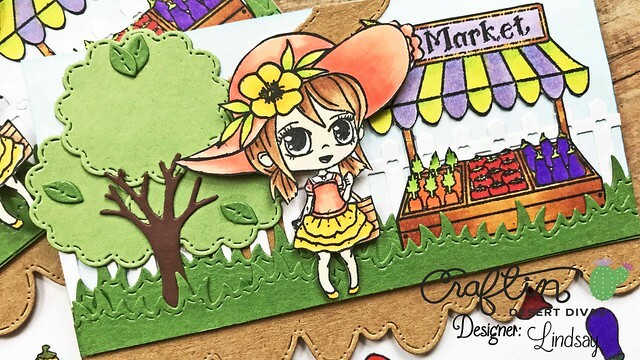 To create the background, I used all of the small vegetable and fruit stamps included in the Market Stand stamp set. After repeatedly stamping these stamps in Memento Tuxedo Black Ink on an A2 sized piece of white card stock, I colored in each of the images with a true to life color. To fix any mistake in my coloring, where i might've went outside the lines, I used my white gel pen to quickly clean up the mess. This is when I realized, with my card design that the majority of the background I just created was going to end up covered, which I though was such a waste. So I cut the A2 background in half horizontally and decided to make two cards with this one background! 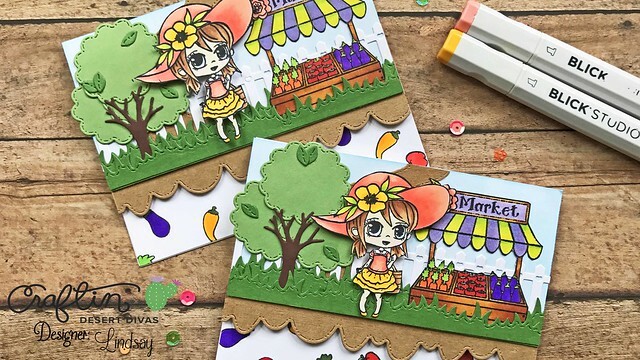 For the top portion of my card I decided to put together a little farmer's market scene. I used the little girl and market stand stamps from the "Market Stand" stamp set, colored them in and fussy cut two sets for the two cards. I also used several die cuts from the Scene Builders die set and Outdoor Landscape 2 die set to quickly put together a die cut and stamped scene. I did used mostly liquid glue to hold everything together and a large acrylic block to hold everything in place while it dried. Be sure to watch the video tutorial for the entire run down in how this top scene was put together! To put together both cards, I first put down the now two pieces of patterned paper on the bottom of an A2 side folding card base with double sided adhesive. Then, to offset and give a bit of separation between the top scene and bottom patterned paper, I die cut a piece of kraft card stock with the smallest scallop from the Stitched Scallop die set and attached the scallop to the bottom of the top scene. Finally, I popped up the top scene with fun foam and double sided adhesive to complete the card! I am never one who likes to waste time or product and using one piece of paper for two cards is a win/win for me! If you are interested in any of the Craftin' Desert Divas supplies that I used on my card today, you will find them all linked below! Until next time, Happy Crafting!! Cute card!! Loved the video!